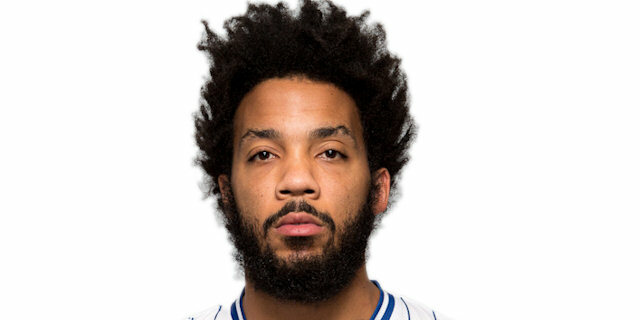 Marcus Williams hit three triples in the final two minutes of the game as Unicaja Malaga finished on an 11-0 run to edge Panathinaikos Athens 66-60 in a Friday night thriller. The hosts rallied from a 12-point second half deficit to pick up a victory that improved their record to 5-5 record and within one win of fourth place Panathinaikos in Top 16 Group E and also gave them a tiebreak advantage over the Greens, which won the first game between them by 5 points. A Jonas Maciulis triple made it 26-38 right after halftime, but Williams and Luka Zoric carried Unicaja back into the game before Williams hit from downtown on Unicaja’s final three possessions of the game to send the local fans into ecstasy. Williams scored 15 of his 22 points in the fourth quarter and made 5 of 7 three-pointers for the game. 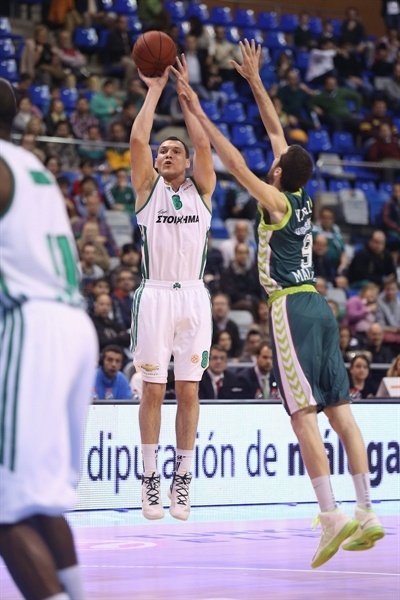 Zoric amassed 14 points plus 9 rebounds, while Fran Vazquez scored 13 points. 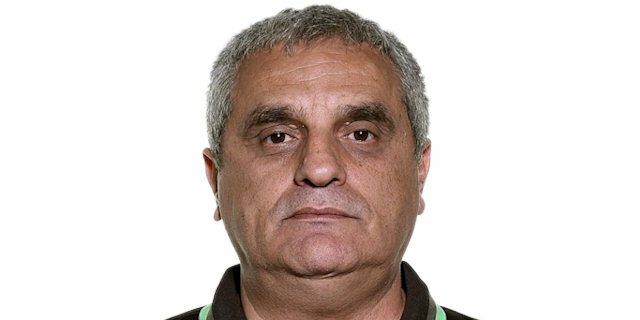 For Panathinaikos, Maciulis netted 15 points on 4-for-7 three-point shooting, Roko Ukic scored 14 and Dimitris Diamantidis collected 8 points, 7 assists and 5 rebounds in defeat. Luka Zoric opened the game with a jumper and Fran Vazquez scored twice after offensive rebounds for Unicaja to move ahead 6-2. 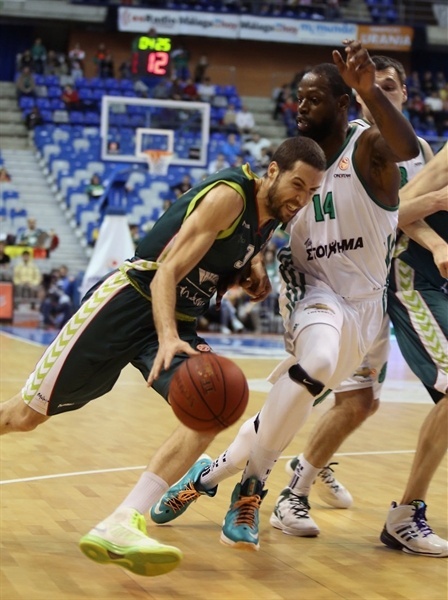 But after James Gist opened the visitors' account, Maciulis and Ukic nailed back-to-back triples, and then Maciulis and Diamantidis each hit a three-pointer for 8-14. 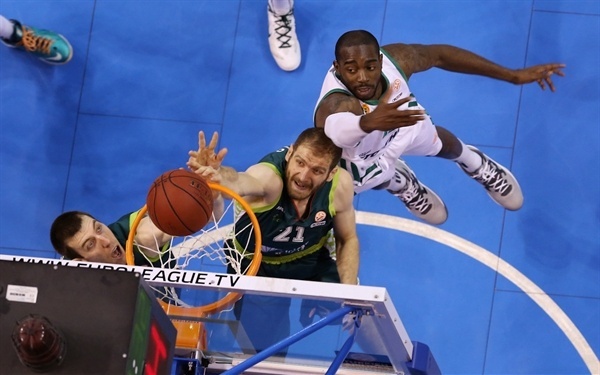 Panathinaikos’s defense did not allow open looks and blocks from Stephane Lasme and Gist helped to hold the hosts to only one field goal in final six minutes of the quarter, before Sofoklis Schortsanitis made a layup for 8-16 at the end of the first. 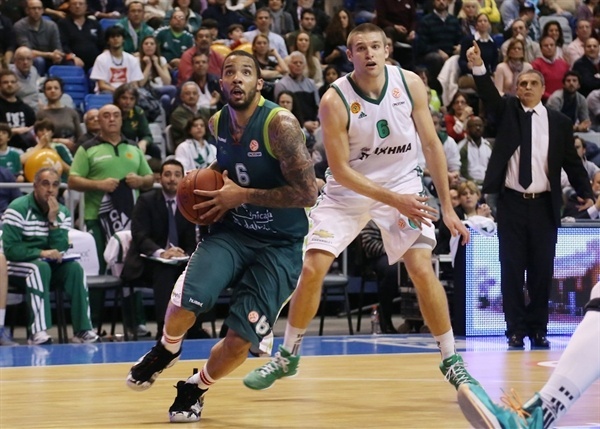 Zoric ended Unicaja’s drought with a layup on the first possession of the second quarter, and Marcus Williams sank a triple for 13-16. Lasme dunked before Williams answered with a baseline floater as the teams went through offensive struggles. A pair of free throws from Marcus Banks, and a put-back dunk from Gist extended it to 15-23, but Earl Calloway hit another baseline floater for Unicaja and Krunoslav Simon sunk a triple making it again a 3-point affair. However, a triple from Gist sparked a 2-9 run that also included a nifty post-up spin-move from Kostas Tsartsaris and a long jumper from Ukic, 24-34. In the final seconds of the half, Williams made both free throws on one end before Ukic split his foul shots to give Panathinaikos a 26-35 halftime lead. Maciulis scored from downtown to start the third quarter, before Zoric made couple of put-backs and Simon a basket-plus-foul. 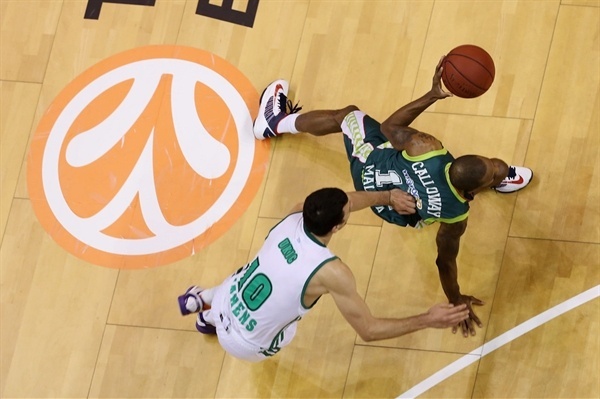 Unicaja raised its level of aggression on defense and sped up its game on offense. A fastbreak layup from Zoric capped a 9-0 run to close within 35-38. Maciulis hit another three-pointer, before Calloway and Ukic traded triples for 38-44. 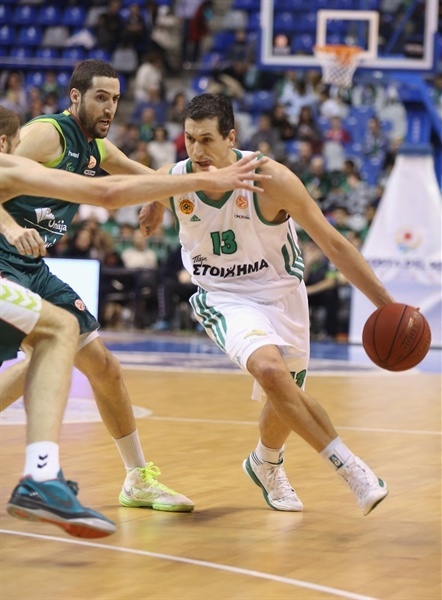 Zoric continued to be dominant on the offensive glass, enabling Vazquez for a basket-plus-foul, but Ukic made a tough triple in between two Schortsanitis baskets that helped Panathinaikos pull away to a 44-53 lead after three quarters. 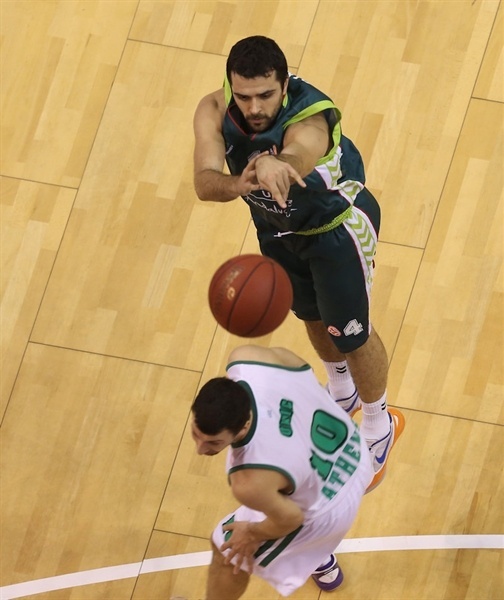 Williams nailed a triple and a jumper to open the fourth quarter, helping Unicaja come within 52-53. After Maciulis hit a long baseline jumper, Diamantidis and Simon traded triples to make it 55-58 as blocked shots from Ukic and Gist helped the visitors stay in front. But, Zoric scored inside and blocked a dunk attempt from Gist, before Williams hit back-to-back triples giving Unicaja its first lead since the opening minutes of the game, 63-60. In the final 40 seconds, Zoric grabbed a key offensive rebound before Williams nailed another three with 21.7 seconds to go, 66-60. On the last possession, Panathinaikos tried to get the deficit under 5 points to win the potential tiebreaker between the sides, but Ukic missed a triple and the home crowd celebrated a vital victory. "I am very happy not only because we won the game, but also because we showed we can compete at this high level. We can fight to be in the playoffs. I am also really happy because of our fans, who saw us fight until the end of the game. During the break, we talked about playing with more intensity on defense and rebounding. We played great defense, fought and scored baskets under the rim. I think this was our most consistent game this season, with great confidence in everything we did. I hope to keep our winning streak going." "It was a stupid loss for us. We had full control of the game. We were a mess in the final two minutes. 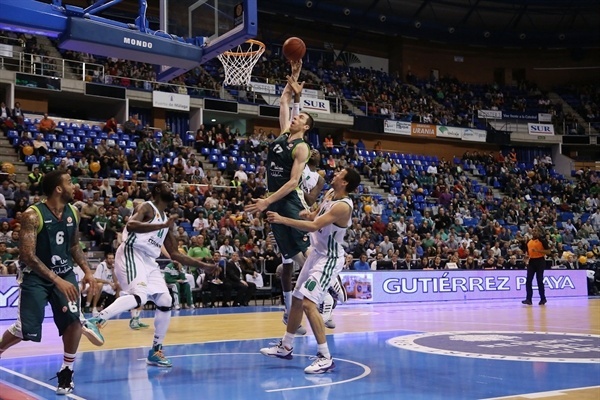 Unicaja took a lot of risks during the game and by doing that, they made the right decision. We lost the game and the tie-break advantage. We have to learn from this game for our future. 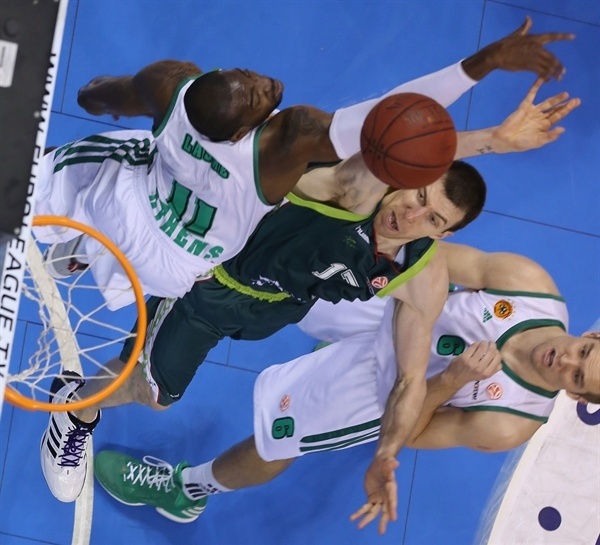 I think that Unicaja will be fighting for a playoffs spot until the end." "We want to carry on playing the way we did today because we managed to beat a great team and managed to get the tiebreak advantage, too. I don't want to focus on my individual performance. I am happy with our good work as a team. We had a great game and have to carry on playing this way, as a team. 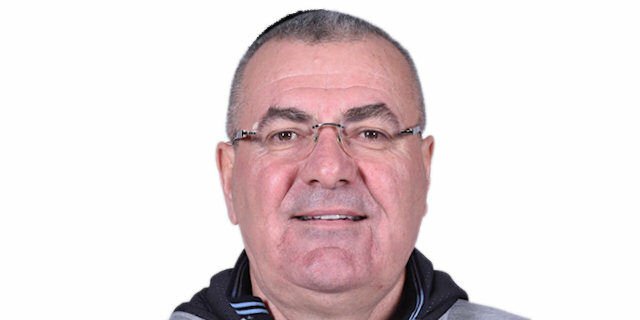 Above all, I hope that Martin Carpena Arena keeps this atmosphere and that the fans carry on enjoying."